COPENHAGEN, Denmark, December 21, 2009 (ENS) – Ecuador’s initiative to protect the climate and the rainforest of Yasuni National Park by leaving its largest oil reserve in the ground will be supported by a new multi-donor trust fund to offset lost oil revenue, Ecuadorian and United Nations officials announced last week in Copenhagen. Ecuador’s Foreign Minister Fander Falconi and Minister of Natural and Cultural Heritage Marie Ferdinand Espinosa, launched the new trust fund together with Helen Clark, the former New Zealand prime minister, who now serves as administrator of the UN Development Programme. “Yasuni National Park is a fantastic project and a big contribution to save our climate,” said Clark at a news conference in Copenhagen announcing the UNDP cooperation with the Government of Ecuador. 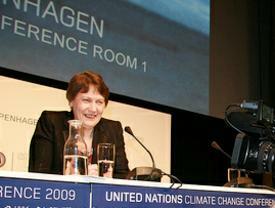 The Yasuni Trust Fund will be managed by the UN Development Programme. It will focus on reducing carbon dioxide emissions by permanently foregoing extraction of fossil fuels from the park; developing alternative energy; protecting indigenous groups; and reducing poverty and inequality through sustainable social development. In exchange for keeping the crude oil in the ground in the Ishpingo, Tampococha, Tiputini (ITT) region, the Ecuadorian government has asked for compensation of $350 million a year for 10 years. The Yasuni-ITT initiative was proposed in 2007 and has been met with widespread international interest, inspiring the government to extend the deadline for the initial $350 million down payment until December. The initiative aims to prevent the extraction of an estimated 850 million barrels of crude oil in the ground beneath the park. 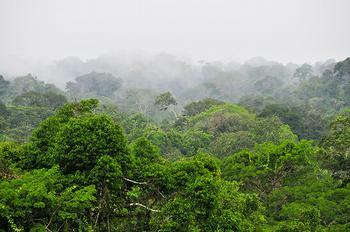 This would prevent the release of 407 million metric tonnes of carbon dioxide and would also protect the indigenous peoples and unique plants and animals that inhabit the park. The park is designated as a UNESCO Biosphere Reserve and is home to indigenous peoples who live in voluntary isolation to protect their way of life. Matt Finer of Save America’s Forests has lived and worked as an ecologist in Yasuni National Park. “The establishment of the trust fund is a critical, and long-awaited, step towards making the Yasuni-ITT Initiative a success,” he said. “For the first time in the initiative’s 2.5 year life span, donors will actually be able to make financial contributions. So we will soon see what countries are serious about backing this revolutionary initiative,” said Finer. Ecuador’s selection of the UN Development Programme to administer the fund is based on UNDP’s record of efficient, transparent and accountable administration of over 30 multi-donor trust funds in over 70 countries, the UN agency said. Covering nearly 2.5 million acres of primary tropical rainforest at the intersection of the Andes, the Amazon and the equator, Yasuni National Park was created in 1979. It is the ancestral territory of the Woarani people, and two other indigenous tribes living in voluntary isolation, the Tagaeri and the Taramenane. Described by scientists such as Dr. Jane Goodall and Dr. E.O. Wilson as one of the world’s most biologically important tropical rainforests, Yasuni is critical habitat to 23 globally threatened mammal species, including the giant otter, the Amazonian manatee, the pink river the giant anteater, and the Amazonian tapir. 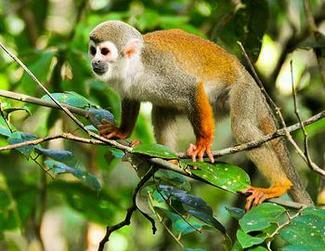 Ten primate species live in the Yasuni, including the threatened white-bellied spider monkey, together with a wealth of unique birds. 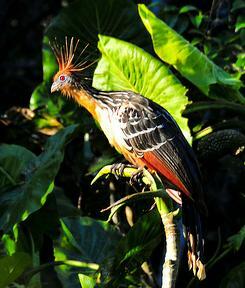 As a result of its unique location, Yasuni contains what are thought to be the greatest variety of tree and insect species anywhere on the planet. In just 2.5 acres, there are as many tree species as in all of the United States and Canada combined. Oil extraction from Yasuni started several decades ago by Texaco, followed by many other foreign oil companies. Dr. Finer and other scientists say it has caused pollution of the land and rivers, deforestation, and disease and deaths of thousands of inhabitants poisoned by the toxic water seeping into the Amazon rivers, and by the polluted fish and animals which they eat. Andes Petroleum, a partnership between two Chinese state oil companies, conducted a seismic exploratory operation in Yasuni National Park in 2006 on the Tiputini River, one of the most intact parts of Yasuni, which is still filled with birds and wildlife. Over the past five years, Brazil’s state oil company Petrobras has been planning for development in Yasuni – first with roads into the rainforest and then, when that plan was turned down, with a roadless plan to build oil production facilities. In 2006, in letters delivered to the Ecuadorian government, more than 40 Yasuni scientists and six international nongovernmental organizations criticized the Petrobras “roadless” plan. They objected to a new processing facility proposed for the alluvial plain of the Tiputini River that called for 16 hectares of mature, inundated forests along the river to be cleared and drained. The rainforest surrounding the proposed sites for two Petrobras drilling platforms is inhabited by large mammal species considered indicators of high quality rainforest, such as tapir, giant armadillo, giant anteater, and large monkeys. The new initiative and trust fund may put an end to such destructive oil exploration and development operations. On July 22 in the coastal city of Guayaquil, the U.S. based nongovernmental organization Amazon Watch, along with the national Ecuador campaign Amazonía por la Vida and the Fundación Pachamama participated with the Minister of Foreign Affairs, the Ministry of Energy and Mines, and other government officials in making the first financial contributions to the Yasuni-ITT initiative. The government has launched a countrywide campaign to raise small donations from civil society. The fund will also accept private and public sector donations, debt swaps, carbon bonds issued in the voluntary carbon market for avoided CO2 emissions, and direct investment in specific government development projects, which would have been financed by ITT oil revenues. The Ecuadorian government has received many international offers of support. On June 26, the German parliament unanimously approved a resolution backing the initiative and committing the government and Chancellor Angela Merkel to financially and politically support of the initiative, as well as promoting it among EU countries and the Club of Paris. It was at the request of the German Parliament that Ecaudorian President Rafael Correa extended the deadline to secure funds until December. Additional support has come from the Spanish government, which contributed an initial $4 million dollars towards Yasuni conservation. President Correa announced at the UN General Assembly in September that Ecuador would permanently maintain its crude oil, estimated at one billion barrels of heavy crude reserves, underground putting social and environmental values first, thereby preventing the emission of the greenhouse gas carbon dioxide.